Looking upriver at the confluence of the Green and Colorado rivers in late September, one of the driest years on record for the Colorado River system. Water managers in both the upper and lower basins are working to get more water to this point in order to bolster the low level of Lake Powell, which is not far downstream. 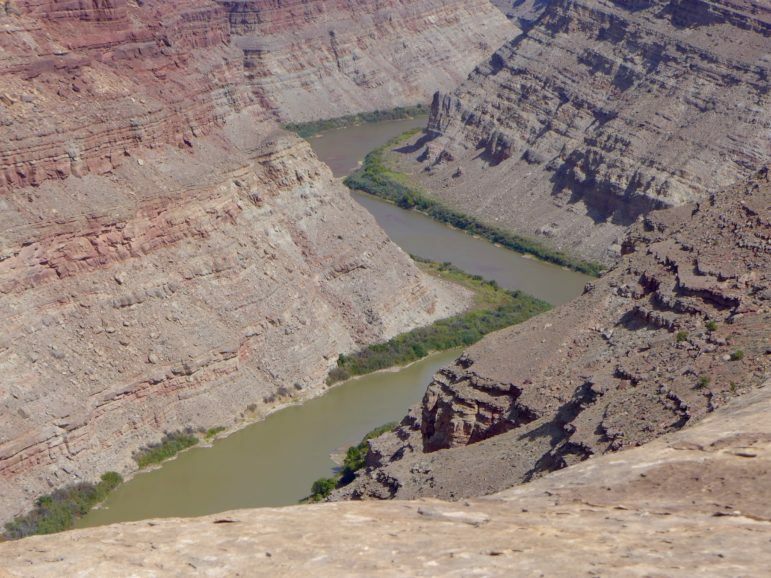 GOLDEN — The state of Colorado is now officially on board with a regional water strategy designed to keep enough water in Lake Powell behind Glen Canyon Dam to avoid violating the Colorado River Compact and keep generating hydropower at the dam. At a meeting Thursday in Golden, the directors of the Colorado Water Conservation Board unanimously adopted a state policy giving its “full support” to proposed drought-contingency plans and agreements now being reviewed in both the upper and lower Colorado River basins. “I think we’ve really done something important for the state today,” Russ George, a CWCB director from Rifle who represents the Colorado River basin within Colorado, told a meeting room filled with water managers, water users and water attorneys from around the state. The new policy means Colorado, along with the other upper basin states of Utah, Wyoming and New Mexico, can declare its support for the drought-contingency plans (DCP) and agreements at a mid-December meeting in Las Vegas of the Colorado River Water Users Association. The lower basin states of California and Nevada also are in support of the agreements, but water managers in Arizona are still working through a series of contentious, complicated issues and have yet to reach consensus. If consensus in both basins can be reached by mid-December, legislation may be introduced during the current lame-duck session of Congress. A sense of urgency to do something about the falling water levels in Lake Powell has been growing, and was heightened in Colorado in 2018 by the hot and dry conditions. Lake Powell on Friday, November 15 was at 44 percent full and at an elevation of 3,588 feet above sea level on the upstream face of Glen Canyon Dam. That’s 98 feet above the “minimum power pool” level of 3,490 feet. The reservoir level has dropped by 38 feet in the last year, and water officials are concerned if dry conditions persist, the reservoir could reach the minimum power pool level within three years. Operations, and reservoir levels, in Lake Powell are tied by regulatory guidelines with levels in Lake Mead, which is 38 percent full today. 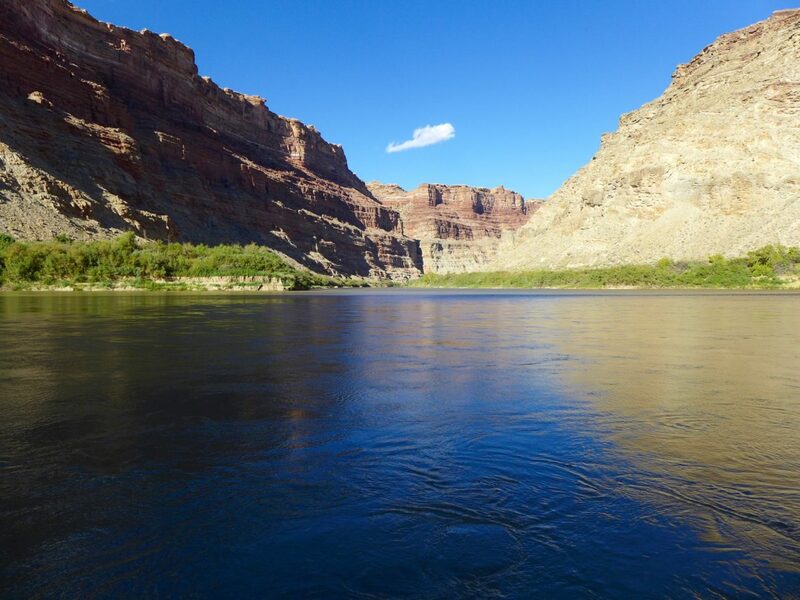 The new DCP storage pool in Lake Powell would be exempt from the operating guidelines, however, and would serve as a secure, and separate, savings account within Lake Powell for the upper basin states. A graphic showing the 38-foot-drop in the surface level of Lake Powell over the last year, from the website, lakepowell.water-data.com. Regional water managers want to keep the reservoir above minimum power pool level of 3,490 feet. The new Colorado state policy adopted Thursday was crafted by staff members at the CWCB, a state agency within the Dept. of Natural Resources, and the attorney general’s office to bridge the latest chasm that had emerged between water managers on the Western Slope and the Front Range. Water officials on both sides of the Continental Divide want to store water in Lake Powell in a regulatory pool controlled by the upper basin, with the goals of first, keeping the reservoir levels high enough to keep producing hydropower at the dam, and second, high enough to continue to release enough water from the dam to meet the upper basin’s downstream obligations under the Colorado River compact. But exactly how water that is now being consumed by farmers and ranchers and city dwellers will be conserved and sent downstream to fill the new pool in Lake Powell is uncertain, and a key issue is whether the state might require mandatory cuts in water use to fill the new pool to avoid a compact call. The Western Slope, lead by the Colorado River District in Glenwood Springs, also wanted the state to help ensure that the creation of the new pool of water didn’t lead to a buy-and-dry of irrigated agriculture on the Western Slope. And they wanted assurances that the state would use a public process to devise any new rules or laws requiring mandatory cutbacks in water use, should low water conditions persist. Meanwhile, Front Range water interests wanted to make sure that the state didn’t tie its own hands and restrict its abilities to take steps to avoid a compact. The confluence of the Green and Colorado rivers, in September 2018. Most of the water that flows into Lake Powell each year flows past this remote spot in Canyonlands National Park. The state’s new policy says it will use an open public process to create a “demand management,” or water-use reduction, program that incentivizes water users — primarily irrigators — to temporarily cut back on their consumptive use of water, in exchange for monetary compensation. And if mandatory cutbacks in water use are ever necessary, “any alternative measures or rules for compact compliance administration” will be developed after “timely and extensive public outreach” and with “the goal, but not the requirement, of achieving general consensus within the state,” the policy says. “The CWCB was very responsive to our request that they display state leadership in establishing a policy that going forward provides some security for the Western Slope and other regions of the state, and that no one region is going to suffer the brunt of a demand-management program,” said Andy Mueller, the general manager of the Colorado River District, after the meeting. Both Mueller and Bruce Whitehead, the general manager of the Southwestern Water Conservation District in Durango, thanked the CWCB board for listening to their concerns, and drafting a policy that attempted to address them. “This was a hot topic,” said Whitehead. Between the two, the Colorado River District and the Southwestern District represent all of the Western Slope. Both Mueller and Whitehead said they will recommend to their boards that they formally endorse the state’s policy at their upcoming board meetings. “Thank you for your thoughtful consideration of public input on this topic of critical importance to Colorado, and for developing a policy that will allow Colorado to engage in further processes that will protect our collective interests in the Colorado River and Upper Colorado River compacts,” said the letter, which was signed by Jim Lochhead, the CEO of Denver Water and the head of the Front Range Water Council. Patti Wells, who represents the Denver metro area on the CWCB, said it was important that Colorado not be split by differences between the east and west slopes. “There clearly is more that unites us in the ability for Colorado not to be subject to a compact call, then there is in the details of how we might avoid that,” she said. Colorado River district GM unveils manifesto on water-use reductions, Sept. 18, 2018. Editor’s note: Aspen Journalism covers water and rivers in collaboration with The Aspen Times. The Times published this story on Friday, Nov. 16, 2018.